A survey released this month by the U.S. Department of Justice found that the vast majority of gun-armed criminals serving time obtained their guns on the street or via other means. 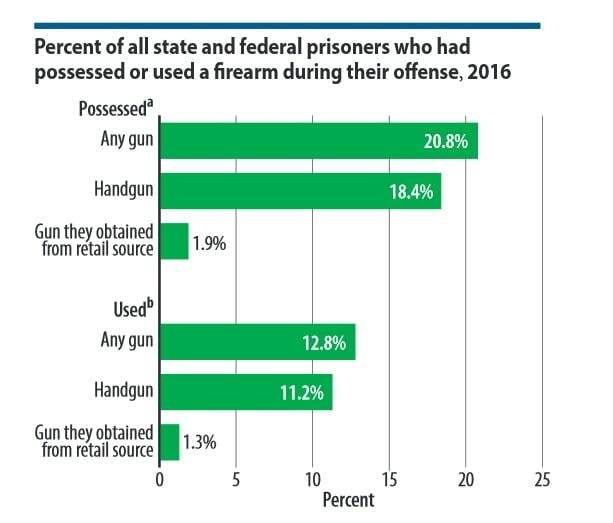 The nationwide survey of 1.37 million inmates at the state and federal level, conducted in 2016, found that about a third said they possessed or carried a firearm while committing their crime. Of those 256,400 prisoners, some 43 percent said they obtained their guns from illicit “street” sources such as other criminals, often by bartering stolen goods or drugs. The next leading source, about 25 percent, came as gifts or purchases from friends or family members. About 6 percent were able to receive their guns through theft. Firearms industry insiders with the National Shooting Sports Foundation said the news comes as no surprise, as they have long noted the steady decline in the number of firearms sourced from gun retailers used by criminals. 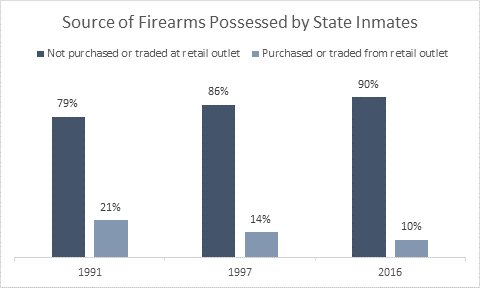 In 1991, retailers accounted for about 21 percent of guns possessed by state inmates. By 1997, the number had dropped to 14 percent. The survey data released this week showed 2016’s numbers declined to 10 percent.